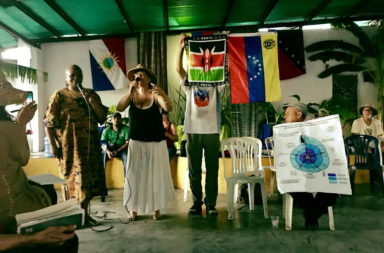 The diverse founders of the First Ecosocialist International explicitly adopted a pluricosmovisionary perspective which establishes the conuco, or small farm, as the base unit for an emergent, future society founded upon the recovery of historical memory, territorial organization by bio-region, the rights of Mother Earth, the decolonization of the mind, and the reconfiguration of indigenous nations. In his article, Richard Smith calls upon his readers to "change the conversation". He asks, "What are your thoughts?" He says, if we don't "come up with a viable alternative, our goose is cooked." I fully agree. So I join the conversation, in order to improve it.